We’d love your help. Let us know what’s wrong with this preview of 風之谷 3 by Hayao Miyazaki. To ask other readers questions about 風之谷 3, please sign up. My experience with this was pretty much the same as with the previous volumes. I liked this one alot, so far a favourite. This is such an amazing work of fiction! The world building is simply astonishing and the characters are all very well thought out and portrayed. The ending of this volume left me in tears. I really wish there was a continuation of the movie Nausicaä of the Valley of the Wind because the story is so amazing and beautiful more people need to know about it!!! i really must say, i prefer the format of graphic novels over manga. it's so much easier to read, mainly it's because the cells are lined up in a linear fashion instead of the typical large triangle, elongated vertical rectangles, along with the square horizontal cells. anywho- the story has really picked up steam! so glad i checked out the third one from the library! i'm totally going to have to go tomorrow to trade it in for book 4! i'm kind of surprised i like this series so much since it's s i really must say, i prefer the format of graphic novels over manga. it's so much easier to read, mainly it's because the cells are lined up in a linear fashion instead of the typical large triangle, elongated vertical rectangles, along with the square horizontal cells. Another great segment of this story. A thoughtful portrayal of war and suffering. I enjoyed the development of Nausicaa and Kushama as characters in this volume. When I first watched Warriors of the Wind, I fell in love with the story (I even have it on VHS). Then they remade it and the story changed. I loved it even more. But the graphic novels are far beyond my expectations. I am not use to reading GN, much less reading from right to left, so this is a wonderful challenge. I am very happy that I have taken the time to read the novels though, as the story is so much deeper than just the anime. This one was a little heavy on the battles and a little light on plot, it seemed; nothing seemed like it wasn't necessary for later plot development, it's just that this particular volume was a little dull compared to the ones that came before. It's all even richer and more interesting than the film, though. This is getting better and better. I have no idea how much of the story they must have cut down for the movie version to just be rated PG, though.. I think this is the one where I really fell in love with comics. I mean madly, passionately in love, because I was already pretty smitten but I don't think I had ever seen or read anything like the sortie from the besieged garrison. Rereading it now years later I think I can still safely say it is the best depiction of battle that I have ever read or seen in any medium. It is the greatest piece of action narrative I know of, at any rate. Travelling through Dorok territory with Kushana, Nausicaa d I think this is the one where I really fell in love with comics. I mean madly, passionately in love, because I was already pretty smitten but I don't think I had ever seen or read anything like the sortie from the besieged garrison. Rereading it now years later I think I can still safely say it is the best depiction of battle that I have ever read or seen in any medium. It is the greatest piece of action narrative I know of, at any rate. Travelling through Dorok territory with Kushana, Nausicaa discovers horrible signs that the miasma of the Sea of Corruption is being used as a weapon. Kushana is determined to rescue what is left of her beloved Third Army, being thrown away in useless rearguard actions by her horrible brothers. Nausicaa just wants to end the violence and reduce bloodshed. In a bargain to secure the release of civilian prisoners she agrees to ride beside Kushana in a daring sortie to destroy Dorok artillery. Tuulen laakson Nausicaän kolmannessa osassa päästään sotatoimien ytimeen. Tässä osassa on melko tavalla toimintaa ja jälleen on hetkittäin haastava pysyä kärryillä, että kuka onkaan kenen puolella ja ketkä tässä nyt taistelevat vastakkain. Kuvitus on edelleen upeaa. Pidän siitä, miten Miyazaki kuljettaa tarinaa välillä hyvin vähällä kerronnalla ja tekstimassalla (tämä toki aiheuttaa paikoitellen aiemmin mainitun ongelman eli haasteen pysyä tarinassa kärryillä) ja välillä hän pyhittää muutaman auk Tuulen laakson Nausicaän kolmannessa osassa päästään sotatoimien ytimeen. Tässä osassa on melko tavalla toimintaa ja jälleen on hetkittäin haastava pysyä kärryillä, että kuka onkaan kenen puolella ja ketkä tässä nyt taistelevat vastakkain. Kuvitus on edelleen upeaa. Pidän siitä, miten Miyazaki kuljettaa tarinaa välillä hyvin vähällä kerronnalla ja tekstimassalla (tämä toki aiheuttaa paikoitellen aiemmin mainitun ongelman eli haasteen pysyä tarinassa kärryillä) ja välillä hän pyhittää muutaman aukeaman enemmälle dialogille ja kerronnalle. Kolmannen osan loppu on henkeäsalpaavan tiivistunnelmainen nostatus ja viimeinen ruutu naulaa tyylikkäästi katarttisen loppusilauksen. Nausicaä on hieno, ylevä ja nöyrä sankari, toki jopa siinä määrin, että saattaa jotain lukijaa ärsyttääkin. Dans ce tome 3, on en apprend plus sur l'empire dork et l'assemblée des bonzes. Cet empire est mené par un chef religieux, maintenu en vie par un procédé mystérieux. Nausicaä s'allie avec la princesse Kushana lors d'un assaut contre l'empire dork afin de pouvoir sauver les prisonniers de guerre dorks. Un tome palpitant, fort en rebondissements, émouvant notamment la fin de la bataille. La question reste en suspens, où Nausicaä va-t-elle aller maintenant que les bonzes voient en elle l'être vêtu Dans ce tome 3, on en apprend plus sur l'empire dork et l'assemblée des bonzes. Cet empire est mené par un chef religieux, maintenu en vie par un procédé mystérieux. Nausicaä s'allie avec la princesse Kushana lors d'un assaut contre l'empire dork afin de pouvoir sauver les prisonniers de guerre dorks. Mittlerweile ist der Krieg im vollem Gange und Nausicaä kämpft Seite an Seite mit der Prinzessin Kushana. Yupa unterdessen kommt dem Geheimnis des Meeres der Fäulnis immer mehr auf die Spur. Außerdem lernen wir einiges über den Titanen und die Vergangenheit dieser seltsamen Welt. Another great volume in the series. 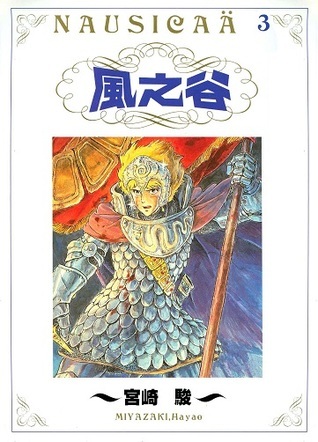 We get to see a lot of Kushana's character in this. She cares deeply for her men, and in return they care deeply for her and are very loyal. Nausicaa is great as well, as she comes face to face with more evil and war. This tale of the girl from the valley of the wind is getting intricate. Even Kuwotawa seems to be warming on me, I hadn't been to keen on him before now. I like the chocobo (horseclaw) at the end. Very cute. Awesome battle sequences, great moral quandries between Nausicaa and Kushana, all around very exciting. I'm consistently pleasantly surprised at the depth of story and the detail of the art as I read this. Goes well beyond the movie... just read it, seriously. The story is still very compelling! Can't wait for the reunion! Definitely worth hunting down the large-format versions of these (rather than the standard manga size). It make following the super-detailed art somewhat easier. Se nota que la historia ya va por la mitad. Es como una bola de nieve que cada vez se va haciendo más y más grande y es indudable que algo épico va a suceder. En este tomo se notan las ganas de ver el desenlace constantemente. Quieres ver que va a pasar a cada momento y vas pasando páginas sin darte cuenta. Además ya empieza a haber muchas explicaciones clave, lo cual solo hace que mejorar el libro. Lo mejor son las estrategias bélicas y la manera como lo explican. No se hace para nada aburrido. Se nota que la historia ya va por la mitad. Es como una bola de nieve que cada vez se va haciendo más y más grande y es indudable que algo épico va a suceder. En este tomo se notan las ganas de ver el desenlace constantemente. Quieres ver que va a pasar a cada momento y vas pasando páginas sin darte cuenta. Lo mejor son las estrategias bélicas y la manera como lo explican. No se hace para nada aburrido. In this volume, Nausicaä goes to war. She ends up in an uneasy alliance with a princess from a distant empire who is as busy fighting her own family as the people she was sent to fight. These people are using the miasma from the forest of corruption as a weapon of war, effectively cutting off their nose to spite their face, losing their own lands to the corruption. We also see more hints of a prophecy that Nausicaä is at the centre of and the expanded canvas of the graphic novels gives this much In this volume, Nausicaä goes to war. She ends up in an uneasy alliance with a princess from a distant empire who is as busy fighting her own family as the people she was sent to fight. These people are using the miasma from the forest of corruption as a weapon of war, effectively cutting off their nose to spite their face, losing their own lands to the corruption. Oh, my dear Nausicaa, you have an enormous heart! I've changed my perspective on Kushana, the way she treated her men, such a charismatic leader, and with such brains, very nice! Miyazaki created two very very great female leads! Even though their paths diverge, I appreciate how both of them come out with their own resolution. The war is really exciting and devastating, they lost so many good man and Kai! 4 stars! I know I'm part of the way into this story. I cannot get enough. I originally thought that this series would just follow the movie. I didn't know that it was much much more. I cannot get enough of this story and am amazed that Miyazaki came out with this. I have always loved his stuff but this brings it to a whole other level for me.